During the first 24 hours of this posting, over 2,000 site visitors read this article. That is a lot for this site. Comments have mostly been expressions of sympathy and sadness. Some readers also expressed a desire to “clear Amber’s name”. My mission is not to clear the name of Amber Hilberling. My mission is to communicate important aspects of this complex case. You can then decide for yourself. Because of the strong interest, I have added new content which I have marked with **. If you are one of the original 2000 readers, just scan the left margin for ** to find the new content. University Club Tower, Tulsa. The window from which Josh Hilberling fell is indicated. Since I met Amber Hilberling I have wanted to write my observations from the time I was an expert witness for her. When I first met Amber, she was already in detention before her trial. She was eventually convicted of second degree murder in the window fall death of her husband Josh Hilberling. But I never seemed to get around to writing. Also, there were times when various legal entities were discussing filing suit against the property, so this also held me back. Now Amber is dead, a victim of what has been deemed suicide, having served about 4 of her 25 year jail sentence. The tragedy of Josh’s death and the tragedy of son Levi’s loss have now been capped by yet another horrible layer, the sad ending of Amber. I am finally writing, but with a heart that is more than heavy. I will also warn (with apology) family members that some of this information may be very difficult to read. 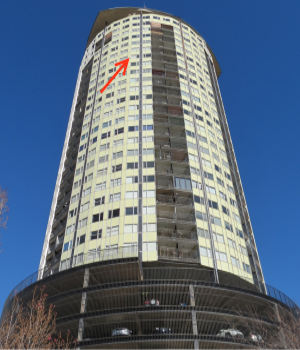 Having expressed the background and my emotions, I am going to move on to the science, the physical facts that were so central to Josh’s fall through the 25th floor glass in unit 2509 of the University Club Tower, in Tulsa on June 7, 2011. The University Club Tower is a unique 32 story cylindrical tower built in 1966. It was the first major building in the United States designed with the use of computerization of the structural calculations. The concern of the structural engineers was to be sure the building was strong enough to prevent swaying in the wind. The building, including its glass-and-panel curtainwall facade was 46 years old when Josh fell to his death in the late afternoon. Layers of caulk were unprofessionally troweled onto the facade. 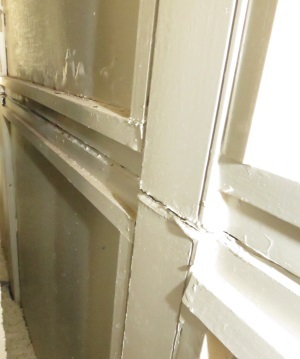 The facade was badly worn and had been caulked-over multiple times, probably due to air or water leaks. Although some of the glass had been replaced in the building, the glass of the incident was almost certainly original. On the interior, the back of the curtainwall was exposed. Cracking and deterioration were visible from the interior. The glass was an unusual insulated glass unit. It consisted of two layers of glass separated by an airspace – that part is normal – but the edges were actually fused together in a U-shape rather than using separate metal or thermoplastic edge spacers in use today. 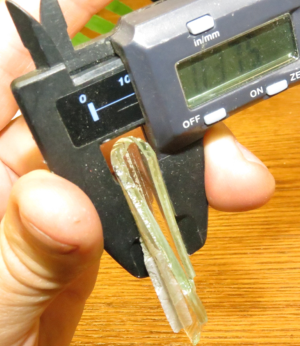 Each layer of glass was only .092″ thick (3/32″), less than 1/8th of an inch. This thickness is known in the glass industry as “single strength”, and is usually only used for picture frames because it is too thin and weak to be used in windows. The space between the glass was also thin, only .191″ (3/16″). This would provide a nominal amount of insulation. It would also, in the event the glass was pushed outward, (deflected), allow contact with the outer lite with similar force. The window glass was annealed, non-safety glass. Had it been tempered or laminated safety glass, Josh would likely not have penetrated the glass. This is because tempered glass is 4 times stronger against wind load and, according to a study I performed, 2.5 times stronger against blunt impact than regular annealed glass. And laminated glass, like a car windshield is designed to hold the glass together if it does break and would continue to act as a barrier after breakage. The glass opening measured 45 3/8″ x 51 1/4″ high, so it was 16.2 square feet. The size of the glass is a factor in its weakness. Larger glass must also be thicker in order to meet loads from wind and other sources. According to the applicable building code, the 1961 Tulsa Building Code, the facade should have been designed to resist a wind load of 30 pounds per square foot, acting either inward or outward. According to wind load charts used by the glass industry at that time, the glass was too thin and should have been at least 1/8″ thick. According to ASTM E1300-94, a more recent calculation method that factors in an allowance for 20 years of glass weathering, the incident glass also is of insufficient strength. 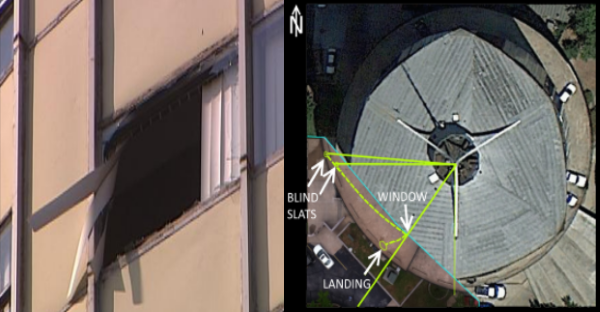 Further, this standard predicts that under a 30 psf wind load, the incident glass would have deflected .82 inches! It has long been known that glass exposed to weather loses strength over time. This is because wind, airborne pollutants and water conspire to degrade the outer glass surface. We have all seen glass with a dulled outer surface on older buildings. This dulling makes the glass weaker, especially in the direction of being pushed out from the inside. Depending upon the amount of degradation, the breaking strength can be reduced as much as 50% (Merritt). 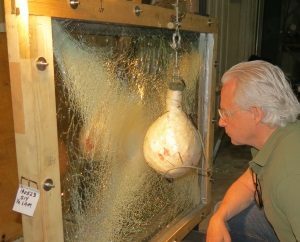 In a laboratory study I performed on 50 year old window glass removed from a building where a small child broke through the glass and fell to his death, the breaking force was reduced 61% compared with new glass. To put it mildly, the incident glass would break easily in the presence of moderate impact. Glass strength calculations are typically based upon the edges of the glass being firmly grasped and supported. The industry terminology is “glazed in a stiff, weathertight rabbet”. Such was not the case at University Club Tower. The interior glazing gaskets were loose and shrunken back, sometimes over an inch. This allowed the glass to rotate out of the glazing pocket during impact or pressure, further weakening the glass. 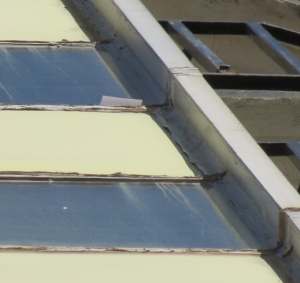 The outer edge of the glass was bedded in old sealant or putty, and then later over-caulked again. This did not create resistance to the force, but rather allowed the glass shards to hinge around the frame to the exterior, like an open door. Shards of glass from the incident window. 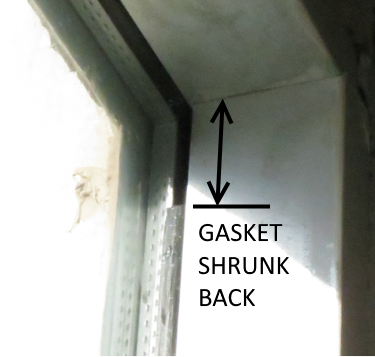 The exterior of the glass was sealed at the exterior face but the interior gasket was shrunken. When impact occurred, the glass edge hinged around the exterior sealant. The glass opened up like a door. Interior view of the window from which Josh Hilberling fell. The top of the glass was 6′-5″ above the floor. This would be just above Josh’s head. Much of his center of mass would be squarely into the center of the glass. According to Amber, Josh weighed 220 lbs. The bottom of the glass was only 26 1/4″ above the floor. According to Amber, Josh was 6′-4″ tall. For such a tall man, the short wall beneath the window probably ended near his knee, amounted to a tripping hazard rather than a safety barrier. 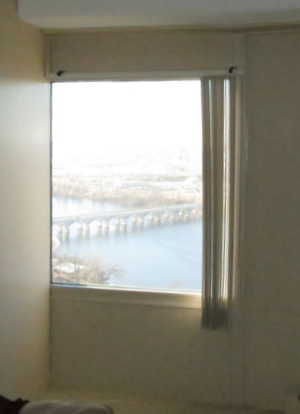 The PVC vertical blinds were fully closed at the time of the incident, which was in the late afternoon. The inner face of the glass was only about 2″-3″ behind the closed blinds. Once Josh’s trajectory brought him in contact with the blinds, he was immediately thereafter into the glass. **Interestingly, Amber told me that the blinds were open during the incident. But the news photo shows the blinds closed and the center batch of slats evacuated from the opening. I believe the blinds were closed because of the heatwave (see next section) and time of day. The afternoon sun would have been blinding in the apartment. In the days before the incident, Tulsa was experiencing a heat wave. There was a rash of water main breaks that were attributed to the hot weather. When tall buildings get hot, the warm air rises through elevator shafts and stairwells, just like smoke in a chimney. 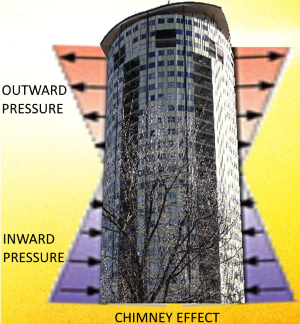 This “chimney effect” results in an outward pressure on the glass in the upper portions of the building. We don’t really know how much outward pressure was applied to the glass, but given the heat, full sun exposure and time of day, chimney pressures can be assumed to be significant. 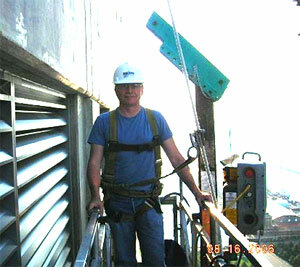 On the tragic day, the wind speed at 33 feet (10 meters) above ground level – this is how all official weather data is collected – was about 18 mph, gusting to 23 mph. Much higher, on the 25th floor (over 200 feet above the ground), surely the winds were much faster and stronger. The wind came out of the SSE. In that direction, there is nothing to block the wind all the way to the Gulf of Mexico (450 miles). You may know that negative air pressures can be strong enough to lift an airplane off the ground. These pressures occur when moving air contacts the rounded front edge of the airplane wing. The air deflects up and over the wing creating a pocket of negative air (some call it a vacuum) on top of the wing, causing the wing to rise. This is how planes fly. This happens on buildings too. Turn the rounded front edge of the airplane wing vertical and you have the facade of University Club Tower. I ran a very conservative wind simulation using only a 23 mph wind blowing at the building from the SSE. One trial I ran showed a 46.5 pound outward load on the incident window glass. Simulation of wind speed and pressured at the time of the incident. Negative pressures at the window sucked at the glass. Once the glass broke, there was probably a rush of wind that contributed to pulling Josh through the window. Left: News photo taken soon after the fall show blinds blowing out of the window opening. I asked Amber if the window appeared to resist the impact. In her words, “No. It was like the glass was not even there.” She said the sound was that of the breaking of a “small glass bowl.” I asked about the condition of the windows. She said the windows were old. They leaked air. The glass rattled in the frame. She knew of no prior cracks in the glass. Considering the chimney effect and outside wind, the rush of air through the window opening could have carried some of the sound waves away from Amber, diminishing the sound that reached her ears. 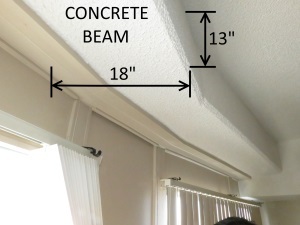 Concrete beam ringing the perimeter of the building. This is in the Hilberling apartment. Typically, this would be the same construction as other floors, including the floor below. It is a very large mass of concrete. The resident who lived downstairs reportedly testified that he heard a noise in the ceiling that sounded like someone running toward the window, and this was followed by the crash of glass. The news report stated it this way, “a neighbor who testified he heard running and a loud crash, followed by a woman screaming”. This gave rise to a theory that Amber butted Josh into the window after a run across the floor. If the neighbor had his window open, I would find the perception of a crash and screaming to be credible. However, the part about hearing running has never rung true to me. Recall that the building design was of concern structurally. It was the first building designed using a computer for structural calcs. There was concern about the building swaying. Now take a look at the picture of the concrete beam ringing the building, supporting the floor slab. It is a monster, far more than you would see in any current building. The floor was carpeted. Amber wore “slip-on tennis shoes”. I do not believe that with all these factors, the downstairs neighbor could hear anything from the domestic scuffle through the floor. The Hilberling and Whitlock families suffered a fatal set of circumstances that came together on that fateful day. It started with domestic dispute, which brought Josh Hilberling in direct contact with weak, unsafe, poorly supported glass in a poorly maintained building on a day when chimney pressures were already pushing the glass out, wind pressures were sucking the glass (and him) out and the wall beneath the window added to whatever tripping may have been in progress. As happens so often in death and injury cases, factors piled upon one another creating a catastrophic result. The recent death of Amber seems a continuation of the falling of evil dominoes that has plagued the families. I wish for all family members, and especially son Levi, that the horror and sadness will finally end and that healing and building can begin. ©Copyright Mark Meshulam. Reproduction without written permission of the author is strictly forbidden.